These guys are miracle workers! David and his team brought back my 60 year-old oak floors from purgatory. Originally, I had inquired about a floating composite floor. After discovering that my floor was salvageable, I opted to restore it. I could not be happier. These folks are the best at what they do, hands down. Based on another review I read, I'm not sure about their behind-the-wheel etiquette, but I guarantee they know how to bring back a wood floor. Perhaps one of them moonlights as an amateur NASCAR driver. Blueline is the real deal. It is difficult to find quality and responsiveness in a competitive market like the Bay Area and Blueline really went above and beyond. I had to rent my house for a relatively quick relocation and needed to get the bathroom flooring redone...before the end of year holidays. Despite a stack of jobs that all needed similar response times, Andy worked with me to get the job completed two days before the deadline. He did an amazing job keeping me informed before the job and checked in during the work to make sure everything was going right. The guy who actually did the work was on time, extremely professional, and completed things faster than expected. It's the little things that make a job go right, and Blueline has it nailed. Definitely give these guys a look. Outstanding customer service! I wasn't sure what I wanted and Andy walked me through my options and came up with the best solution to meet my needs. I have to say I am very impressed, and I've been very happy with the outcome, his attention to detail is amazing. Thank you Andy! Blueline Floors was great to work with, we bought a home that needed a lot of work and Andy helped us make a selection within our budget that looked great. I've recommended Blueline to other friends and they've been just as happy. At my work we recently had installed some wood floors in our showroom. My boss said Blueline was very helpful when he visited them just a couple doors down. The installation experience couldn't have gone better. The man installing the flooring was very professional. He kept his work area clean and neat. We will definitely be doing business with them in the future. As a builder I call Blueline whenever I have flooring needs. Andrew has an Eyeball for detail that is second to none! Blueline does great floors. We hired them to refinish our hardwood after it had been under carpet for 25 years... the floors look great. I highly recommend them. Blueline Floors installed this distressed hardwood floor in San Carlos, CA for a commercial client. 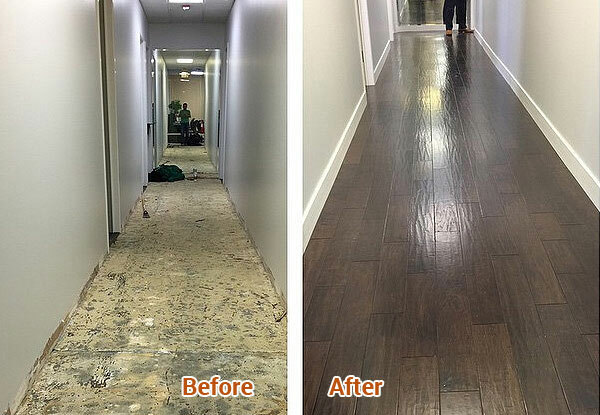 We tore out the old carpet and installed hardwood floors and baseboards throughout the building of this local real estate agency.